I’m not even going to talk about how gosh darn adorable these Chocolate Chip Cannoli Cups are. The pictures speak for themselves. They’re downright precious. What you can’t taste from looking at the photos is that these little cups are overflowing with sweet, creamy marscapone and ricotta cannoli filling that is jam packed with chocolate chips. It also doesn’t hurt that this sweet, cheesy goodness is nestled in flaky phyllo cups and that the whole recipe takes about 10 minutes to make. Ten minutes? Don’t mind if I do. You can even make and refrigerate the filling ahead of time and then just spoon it into the cups before serving. It doesn’t get much easier! Even if you buy pre-made fried cannoli shells, stuffing the filling inside can be a pain. 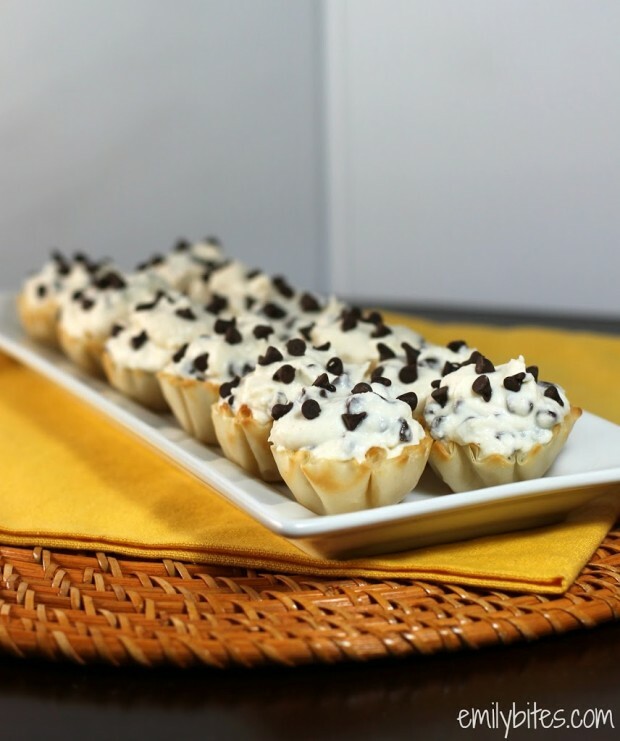 This Chocolate Chip Cannoli Cups recipe solves that problem and weighs in at only 63 calories (or 3 Weight Watchers SmartPoints) per cup. If you’re looking for a quick, sweet Italian finish to any meal, this is the dessert for you! Place phyllo shells* on the counter to thaw for at least 10-15 minutes. In a medium sized mixing bowl, combine the marscapone, ricotta, powdered sugar, vanilla and cinnamon and stir together until thoroughly mixed. Reserve a small pile of the chocolate chips for topping and stir the remainder into the cheese mixture. Spoon the filling evenly between all the phyllo shells. Sprinkle reserved chocolate chips over the tops and serve. *I recommend you only defrost/fill as many as you plan to eat at once so that the shells stay crispy. You only thaw the phyllo cups? No baking them off? Only 63 calories? That is math I like. And I love cannolies, especially when they are freshly made. If I had a plate of these in front of me, I think I would pop every single one of them in my mouth! 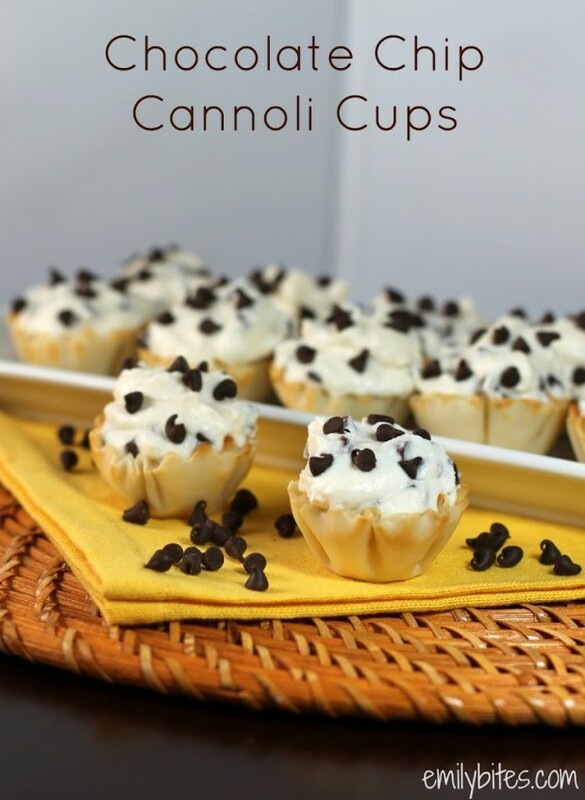 These are so cute!I love cannolis..and the little cups will make me feel a little better about eating them! YUM! Need I say that I love you :), I love, love, love cannoli and you made them fit into my diet, woohoo! Self control is not a phrase I’m good at. So, I would literally have to make one at a time, and keep the filling separate and fill as I get one. But Lord, these look adorably delicious!!!!!! I made these on the weekend – my first recipe I make of yours after following for a few months and they were very yummy! My husband and daughters loved them too, they are going to be a regular in our house I’m sure of it! I made a double batch of these for a party we hosted over the weekend — they were gone in a flash and I got SO many compliments on them! Thank you for the great recipe. They came together so easily and they were delicious! I love this! This is such great recipe. I really need to try it out. I absolutely love your blog! I will definitely be following you on Bloglovin/GFC/etc. Be sure to hop on over to Lynn and Lou for a wonderful Giveaway! for the powered sugar…is it 3 tablespoons or teaspoons?? same for vanilla…teaspoon or table?? Approx how much of the filling goes into each cup? Emily sometimes you say things like 2 oz cheese. Is that by weight or in a cup? I made these on Sunday evening and we each ate three a night! They are delicious. What a great concoction! how long would you say the filling stays good for in the fridge?? These look amazing! We all love cannolli – and I can’t wait to make them tomorrow for a family get-together! Just made these and my are they good; but I’m worried that I might be in trouble as they are hard to resist! Another fabulous recipe, thanks so much! Hi! I made these this past weekend for Easter- they were delicious! The batter was very very runny though, I even put back in the fridge over night before assembling thinking that was the issue. Could it be I didn’t add enough marscapone? That’s the only ingredient I was unsure of the measurement. Hi! I loved the taste of these. I am unsure if I made them incorrect because they were gritty texture like… Or is that the cheese in it? Thanks for all your amazing recipes. I’m learning new things every week off your blog.